The John Marshall High School administration is proud to announce the Top 5% from the Class of 2018. Seated from left are the Top 1%: Amanda Palmer and Colerain McCardle. Not pictured is Abreanne Andlinger. 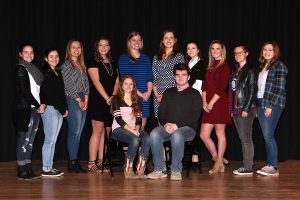 Standing from left are the Top 5%: Sarah Sberna, Brenna McIntyre, Megan Denning, Jada Voellinger, Mackenna Strait, Maggie Lyons, Alexa Jasinski, Kassie Frohnapfel, Brandi Hall and Jennifer Whitfield. Not pictured is Alyssa Ehni. All 2018 John Marshall High School graduates will be honored on Thursday, May 17 at 7:00 p.m. at WesBanco Arena during the school’s 50th Commencement Ceremony.